Thanks so much to Kari for the nomination. Check out her awesomeness at Kari's Crowded Bookshelf. Go on. 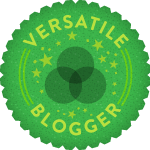 Nominate those 5 bloggers for the Versatile Blogger Award — you might include a link to this site. 1. I am in love with musicals. No matter what. Even High School Musical. 2. I love Nutella. I'm having my daily dose right now, as I'm typing this. 3. My best friend and I made a promise that we would travel to Ireland together, because it is beautiful and filled with beautiful people. 4. My dream jobs would be a book editor, a National geographic photographer or a Pixar animator. 5. I am in the process of learning how to drive. 6. Titanic is my favourite movie. 7. I live in New Zealand.